A French couple is settling down in a beach house in Kottivakkam. After a quick dosa from a restaurant down the road, they’re off for a short walk along the shore. The sun is beating down ferociously, and they love it. “Back home in France, it is so cold,” says the husband, with an exaggerated shiver. The couple are on a pan-India tour, starting from Chennai. And to truly feel at home, they’re living in a house instead of a hotel courtesy Couchsurfing, a peer-to-peer accommodation platform that is rapidly changing the way people travel. From the room where they are staying on the first floor, a huge window opens up to a magical view of the sea. The owner, Sushanth Shyamsundar, tells them where to hang out in the evenings, and the best time to hit the beach. Staying in a hotel was never even an option for the young couple. When they travel, they want to experience the local lifestyle, and hosts like Sushant are more than willing to help. Now, people are moving to a more organised version of Couchsurfing like Airbnb. Airbnb, and similar platforms such as Housetrip, Homeaway and Roomorama, have completely changed the travel accommodation scene in cities like New York, Paris and London, there’s a similar movement happening here in India. Home owners from across the country are opening their doors to warmly welcome guests from across the world — whether it’s through the good old Couchsurfing or the relatively new Airbnb and Stayzilla. While Couchsurfing is absolutely free, Airbnb offers apartment spaces at a price fixed by the host. The former doesn’t necessarily guarantee a room (you might end up on a couch or a sleeping bag) and works purely on trust, the latter is more professional, beneficial for the host and offers a private space for the guests (usually between the range of Rs. 1,000 to Rs. 6,000 a night). Stayzilla, which offers one of India’s largest collections of online accommodation, and is known for catering to price-conscious Indians, recently made its entry into home-sharing, aiming to become the ‘Facebook of travel’ — the app unlocks the properties after matching their interests with that of guests. 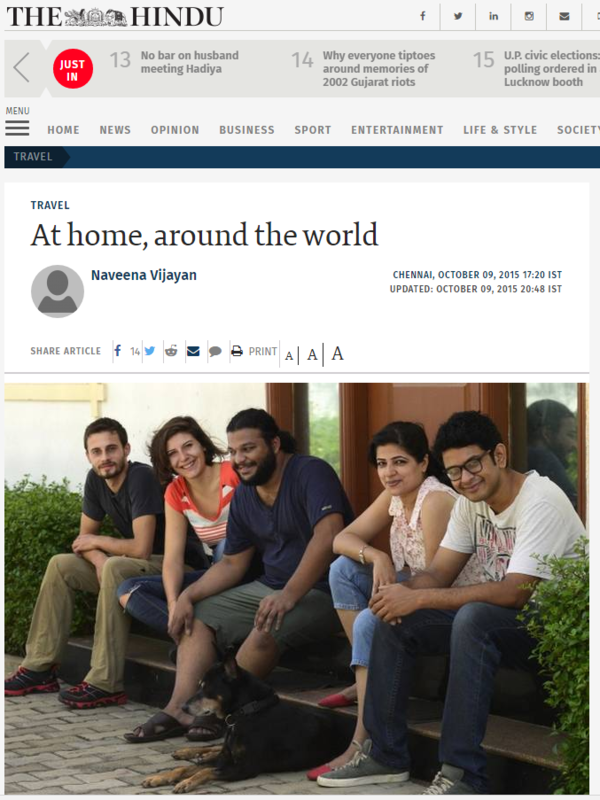 “Staying at someone’s home helps you discover interesting places that are not mentioned in travel guides,” notes Kiruba Shankar, who has been hosting people through Couchsurfing for over a decade, and has even authored a book called COUCH: How a Simple Furniture is Helping World Travelers Save Money and Build Lifelong Friendships. Arvind Ravindran, who is into construction, has an eight-room apartment (with special sea-facing rooms) in Thiruvanmiyur listed on Airbnb as ‘Beach Elegance’. A 40-feet road separates his house from the beach. “Around 90 per cent of the requests come because of the apartment’s location. It is safe and clean, and we organise barbecues on the beach. I have a caretaker who attends to the guests,” he says. Since the house is close to a clutch of IT companies, most of his guests are foreigners who have been posted here for short-term projects. Additionally it’s proximity to a few marriage halls, makes it one of the top choices as well for NRIs who come in large groups. Then there are hosts like Chandy Kurien, who has been given a “superhost badge” by Airbnb (It’s given to people who host at least 10 trips, receive five-star reviews at least 80 per cent of the time, and complete reservations without cancelling). He is into it purely for the love of meeting new people. “Having retired from the Indian Navy and 20 years later from Bank of Baroda, life was becoming monotonous. There was no dearth of money, but people and relationships were evaporating. On September 1, 2014, I signed up on the Airbnb site and I got my first guest in less than 10 minutes,” says Chandy. He rents a room in his apartment for Rs. 1,804 per night, and has hosted over 30 guests (75 per cent foreigners) ever since. While there were issues in the beginning, he is happy that the Government has woken up to the growing industry of home sharing. “It is completely legalised. We collect service tax from the guests, and pay it to the Government — all through the site,” he explains. * Salman rents out a caravan on Airbnb for Rs. 6,706 per night. It is a mobile home meant for travelling. The first 20 km are complimentary and every 100 km is $ 50. Guests will have access to bed, TV, DVD, microwave and toilet. * Sabita hosts a fully-furnished rustic cottage for minimum one week stay at $ 79 per night. The place listed as Once Upon A Hut is a stone’s throw away from Cholamandal Artist’s Village. * J.K. Mahendra hosts a room in his apartment called Cricketer’s Hut in Egmore. The description of the house says it has a variety of cricket memorabilia. Wwoofing — World Wide Opportunities in Organic Farming. People can stay for weeks or months at the owner’s farm, and in exchange of accommodation and food, they have to put in five hours of work. A global movement, it lets foreigners experience village lifestyle and learn the concept of farming. Website: www.wwoof.net. Offers long-term stay in a particular home in exchange for services. For example, an old couple can rent out a room to youngsters for free, if they run errands (going to the post office, buying groceries, taking care of pets and such). Website: www.homeshare.org. It allows two parties to swap their homes for a set period of time, with no monetary exchange taking place. Turns unfurnished houses into fully-furnished and managed apartments and provides them at affordable prices to pre-verified tenants (targets college-goers, and fresh graduates) on a shared renting basis.